Hi, I’m Debbie and I blog over at Hello Deborah. My little family is made up of me, my husband and our little girl Eleanor who is nearly 9 months old. 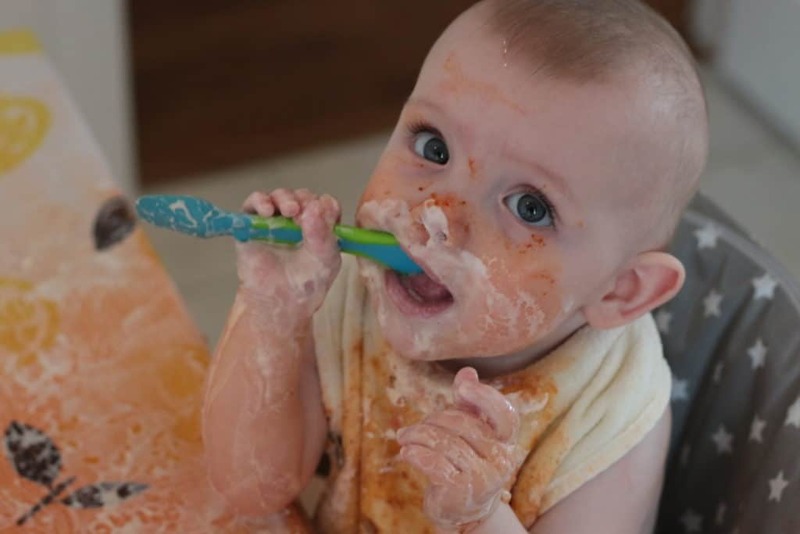 We’re in the throes of weaning at the moment and we’ve been doing baby-led since the start. We started Eleanor on foods at a little over 6 months. I was so excited to start her bang on 6 months but she wasn’t sitting up at that point. Within a week she was sitting and she started her journey herself by stealing my lunch out of my hand! Talk us through your journey, how did you start, what did you do? Eleanor literally puts everything in her mouth so I thought she would be great at baby-led weaning. Her first food was cheese on toast while she was sat on my lap and she pinched it out of my hands. So that evening I cooked our usual meal with less salt and plonked it down on the table in front of her. She went straight for it! Not much went in her mouth and she didn’t swallow anything but it was just the beginning. I had planned to slowly introduce meals over the next few weeks but when it came to it I just dived straight in. Whatever meal Eleanor was awake for she ate. We had to change out meal times to fit in better with her schedule so we now eat dinner as a family at 5:30 if my husband is back from work in time. I personally want Eleanor to be eating her meals with me. 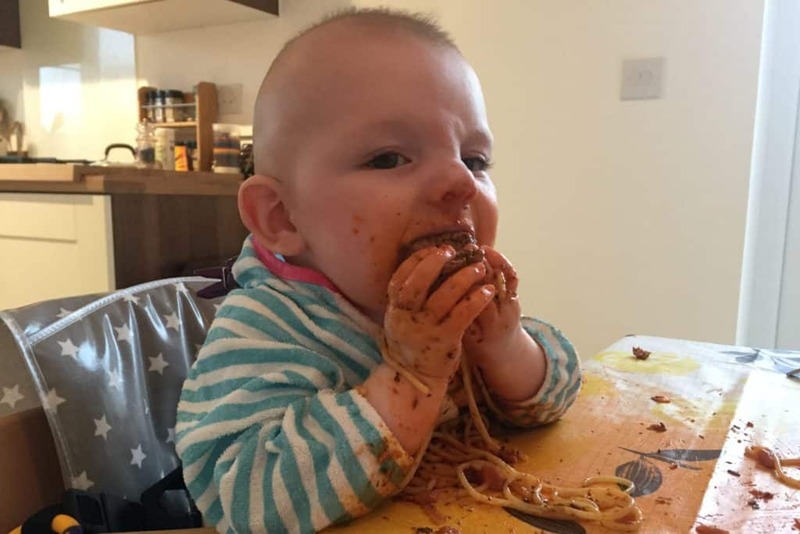 What food did baby love and what was their least favourite food? 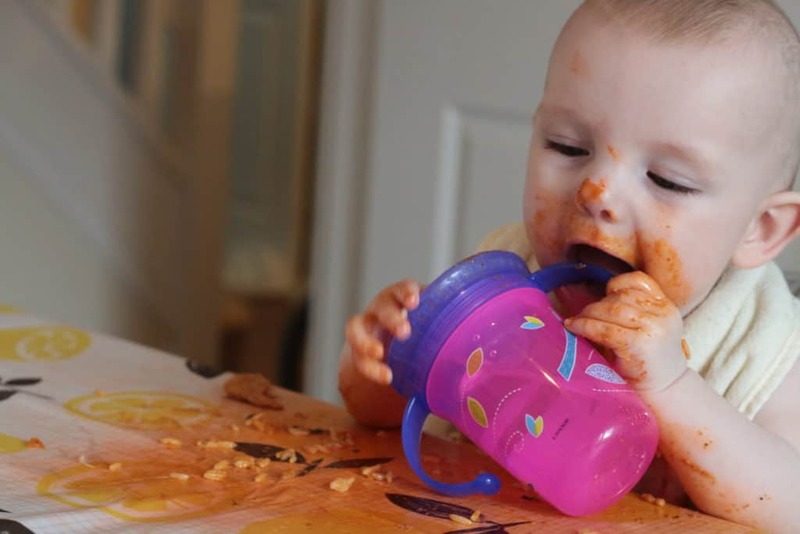 Eleanor absolutely adores pasta, especially with bolognese (oh the mess!). She also is partial to bread sticks and hummus, strawberries and cheese. Her least favourite food would be broccoli which she just holds and stares at before throwing it on the floor. What sort of food did baby eat when you are out and about? Depending where we are going I’ll either offer some of what we’re having or I’ll bring a little packed lunch. One of my favourite places to take her is IKEA as she can have some vegetables and mash off of my plate and they have everything there you could possibly need (bottle warmers, bibs). If I take a packed lunch I’ll usually include breadsticks, hummus, fruit, vegetable sticks as they’re so easy to have in my bag. What highchair did you use? Would you recommend it to other Mums? I have a Stokke Tripp Trapp which I love as I can pull her directly up to the table and she eats with us. At her grandparents’ house, we have the IKEA Antilop with the insert (buy a spare for out and about!) which is really good. We’ve been using it in the garden recently. I’d recommend either of them as they are both great and at different ends of the price spectrum. What is your opinion on offering baby fast food? I wouldn’t at the moment as she’s just so young but maybe when she is older. I think everything in moderation is so important. Although she’s already had one McDonalds chip. The worry that she’s not eating enough has been challenging. I often hear that food is fun before one but then I see my friends who are traditional weaning and they’re eating loads. Depending on what meal I serve sometimes Eleanor won’t eat anything. Luckily not too much. One family member keeps telling me Eleanor needs rusks and purée so she has different textures. Another relative says I should be spoon feeding her, even though that person doesn’t even have any children. But apart from that I’ve only had really positive comments. I think when people see Eleanor eating they’re amazed – especially when she tucks into a whole apple. I find I need to meal plan so that I remember to give Eleanor lots of variety. We didn’t eat particularly healthily before starting so weaning has been the kick up the bum we’ve needed to sort our diets out. An extra IKEA Antilop high chair insert. This is great for when out and about as the high chairs in some restaurants are far too big for Eleanor. I keep the spare insert in my changing bag to blow up when we need it. Do what works for you and your little one. Let them guide you. You can read previous installments of Weaning Wisdom Wednesdays here. I love the photos of Eleanor eating – she’s so into it!! Some great tips there, I’ve never heard of an ikea insert, will have to have a look.